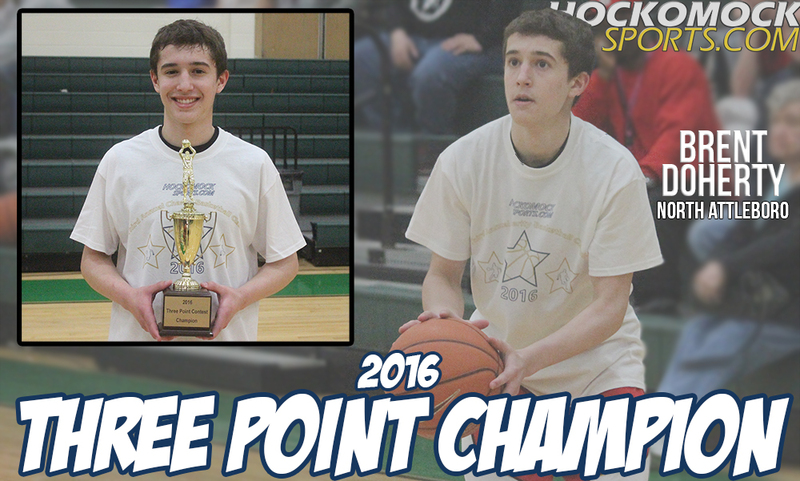 In the final event of the 2016 HockomockSports.com Charity Basketball Classic, North Attleboro junior Brent Doherty was the last man standing in the annual Three Point Contest. Doherty reached the finals when he sank 16 of his 25 shots in the opening round. Foxboro’s Alex DuBrow connected on a round-high 17 three pointers in the opening round to secure his spot in the final. DuBrow and Doherty squared off head to head, shooting at the same time on opposite ends of the court. Doherty hit on 15 threes and DuBrow sank his final corner three to tie him at 15. In an overtime round (30 seconds), Doherty took home the hardware by hitting eight three pointers. Both Doherty and DuBrow broke the record for most threes made in a final round, edging out Ryan Boulter’s record of 14 in 2015. Doherty now holds the record for most threes made in one event with 39, eclipsing Boulter’s record of 34 set last year. The North Attleboro guard now also has the record for most threes made in the event for a career with 50 after hitting 11 in 2015. Taunton junior Tommy MacLean jumped into third all time in threes made in the event with 37. WORCESTER, Mass. – Numbers don’t always tell the whole story of a game, but they certainly help explain what happened. Franklin went from shooting 50% in the first half to just 26% from the floor in the second. Franklin hit half of their six three point attempts in the first half but struggled from deep in the second half, going 1/9. St. John’s shot over 40% from the field for the game (nearly 50% in the second half), had a plus-15 advantage on the glass and went 16/19 from the free throw line. Those numbers totaled up to a 67-52 win for St. John’s over Franklin in the D1 Central Sectional Final. It was an impressive start for Franklin, forcing five turnovers in the first three minutes of play. Senior Kevin Gill and sophomore Paul Mahon harassed the Pioneers at every bounce of the ball. That defense turned into offense as Franklin built an 18-14 lead at the end of the quarter. But with that tenacious defense came seven fouls called in eight minutes of play (compared to just two for SJS). And a minute into the second, both Gill and Mahon had picked up two fouls apiece. That allowed the Pioneers to creep back into the game, plus St. John’s 11 first half offensive rebounds. The Pioneers closed the first half with a 10-3 run over the final 2:41 to take a 34-33 lead into halftime. “Unfortunately we got into some foul trouble,” Franklin head coach CJ Neely said. “Paul was doing an excellent job on defense and then we picked up his second foul. Gill was doing a terrific job on defense then he picked up his second. Sam Harrell comes in and does a pretty good job but then he picked up a couple. Three of our best defenders ending up sitting on the bench in the first half for a long period of time and that’s going to hurt you. With the individual talents they have, that’s going to hurt you. The first big deficit for the Panthers came when Sean Burke converted a putback to put SJS up 43-37. Paul Mahon’s corner three (the Panther’s lone connection from deep in the second half) cut it back to five but a bucket inside and a pair of free throws pushed the lead to 49-40 with 2:54 to go in the third. SJS held a 51-44 lead going into the final frame. Franklin pulled within a possession at 51-48 with 5:56 to play behind baskets from Gill and freshman Jay Dieterle but Burke netted four straight points to stretch the lead again. Franklin had a pair of bad breaks down the stretch as after the Panthers came up with a stop, the rebound bounces out off a Franklin player and SJS scored right away. Then after a three point play cut the deficit to six with 2:46 to play, the Panthers got a stop on the other end only for Alex Bradley to get the tip in to put it back to eight. The Panthers pushed hard with a press to try and create some more turnovers but the Pioneers were able to break it and extend the lead. Gill scored a career-high 17 points in his final game for the Panthers while Dieterle added 11 points and five rebounds, sophomore Connor Peterson had eight points and four rebounds and senior Tim Prunier finished with seven points and seven assists. Franklin boys basketball wraps up the season at 18-7 with its first Hockomock League Kelley-Rex title since 2012. WORCESTER, Mass. – There was no second half drama this time around. 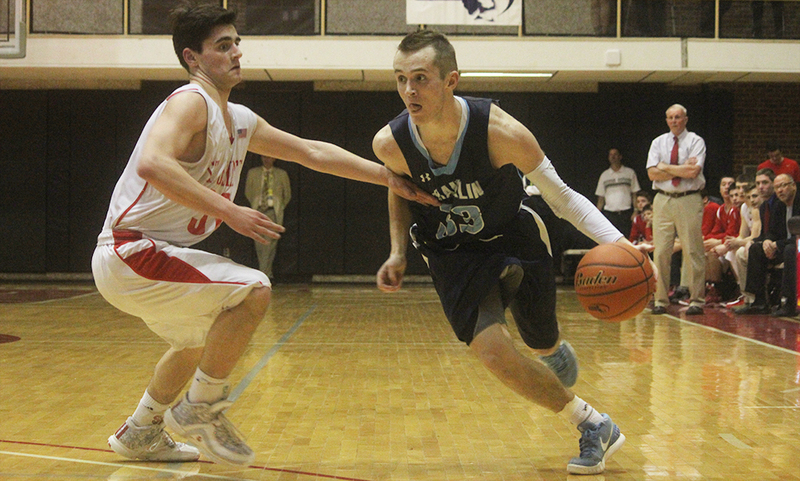 After nearly blowing a double-digit cushion in the opening round of the playoffs, Franklin raced out to a huge first half lead and never looked back with a 73-36 rout of 7th seeded Framingham. With the win, the Panthers return to the D1 Central Final for the second time in three years. It didn’t take long for Franklin to establish its dominance, forcing a turnover on Framingham’s first possession and getting stops on the next four. On the other end, Paul Mahon’s second make of the game, this one a three, capped a 9-0 start over the first two minutes of play. Freshman Jay Dieterle pumped in nine of his team-high 15 points in the first quarter to give the Panthers a 20-5 edge at the end of eight minutes. It was more of the same in the second quarter. 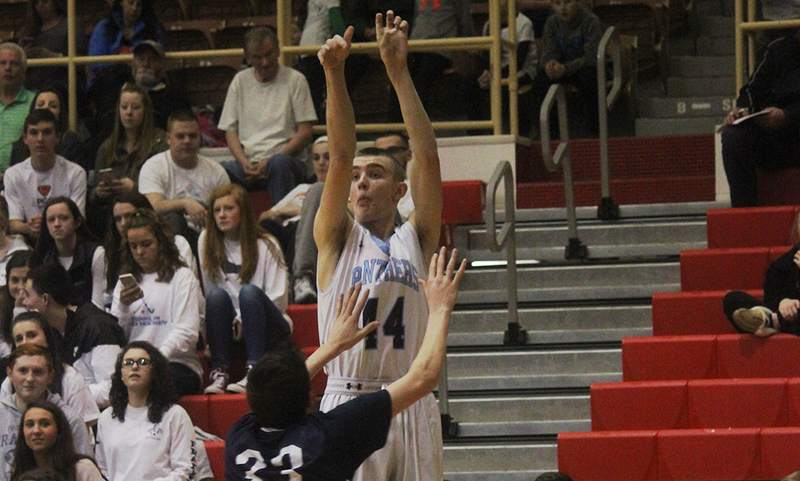 Sophomore Connor Peterson was a force in the paint, scoring nine of Franklin’s first 11 points in the quarter. Defensively, the Panthers forced four turnovers in the first five minutes of the second quarter and forced the Flyers to go 0/7 from the floor in that stretch. Framingham hit a pair of free throws in the quarter but did not connect on a field goal in the second. Josh Macchi scored inside and Mahon drained another three late in the quarter, giving Franklin a commanding 36-7 lead at the break. The Panthers got a good start to the second half as Dieterle sank a three, Prunier hit a pair of free throws and Mahon drove to the basket for two more to create a 43-7 lead. Midway through the quarter, the Panthers were able to rest their starters. Senior Patrick Rodgers, sophomore Connor Goldstein and freshman Jalen Samuels all netted six points off the bench in the second half and junior Ryan Hodgkins added five points. Dieterle added six rebounds to his 15 points while Peterson had a double-double with 15 points and 11 rebounds. Mahon, a sophomore, was third in scoring with 10 points. With the starters on the floor in the first half, Franklin’s defense was tenacious and the Flyers shot just 2/25 from the floor. Franklin boys basketball (17-5) will now play top-seeded St. John’s Shrewsbury in the D1 Central Final on Wednesday, March 9th at 7:00, back at WPI. SJS (21-1) beat Wachusett in the other semifinal. #3 Franklin, 73 vs. #7 Framingham, 36 – Final – The Panthers were in control from the get go, taking a 36-7 lead by halftime. Sophomore Connor Peterson had 15 points and 11 rebounds and freshman Jay Dieterle added 15 points and six rebounds. Franklin will play St. John’s Shrewsbury in the D1 Central Final on Wednesday, March 9th at 7:00 at WPI. #6 Foxboro, 57 @ #3 Falmouth, 59 – Final (OT) – Cassidy Harrison hit a pair of threes late in the fourth quarter to help the Warriors force overtime. Harrison finished with 20 points while Ashley Sampson added 14 points and Carolynn Will finished with 10 points. #4 Franklin, 1 vs. #5 Walpole. 0 – Final – Sophomore Luke Downie scored on the power play in the second period for the lone goal of the game. Nick Jasinski made 17 saves for the shutout win. Franklin advances to the D1 South Semifinals and will play Newton North. FRANKLIN, Mass. – Franklin senior Kevin Gill can add another team to his list. For the third time this season, Gill was to go-to guy in crunch time and on Thursday night, his strong take to the basket with 15 seconds to play gave the Panthers a 62-60 win over Westford Academy. While the layup broke a tie game, it was nearly a basket that brought Franklin back from a deficit. With just over a minute to play with the game tied a 60, Franklin had an inbounds play in the offensive half, right in the corner. The play went awry and senior Tim Prunier’s inbounds pass went straight into the hands of Westford Academy’s Nicholas Fiorillo. Fiorillo took off, racing out into a breakaway all alone on his way for a layup. What looked like a certain basket for the Grey Ghosts quickly turned into one of the best hustle plays you’ll see. Prunier got on his horse and sprinted back on defense, getting back in time to knock the ball free from the dribble just before Fiorillo went up with it. As the ball bounced towards the baseline, Prunier lounged and dove, getting a hand to the ball and whipping it back in bounds. Gill was able to get a hand to it, deflecting it on and the Panthers were able to keep possession. Westford Academy did not score again. 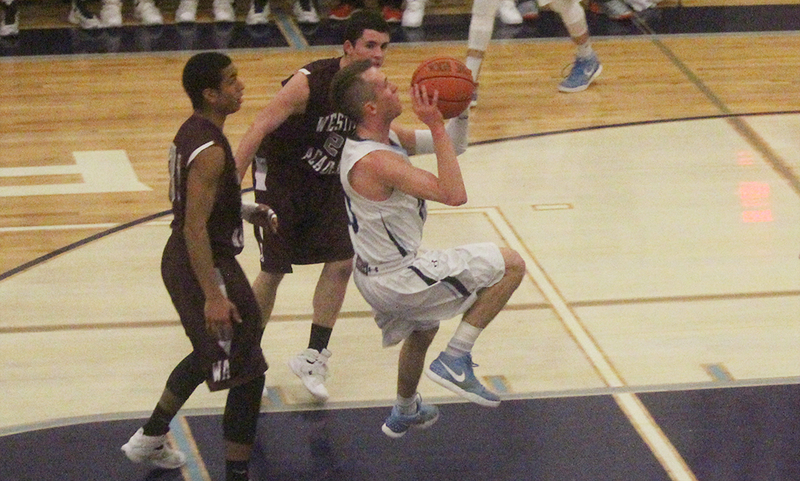 Gill scored six of Franklin’s nine points in the fourth quarter while Prunier had a layup of his own. Franklin dominated the first half and took a 15 point lead into the locker room but a furious rally from the Grey Ghosts brought the teams level at the conclusion of the third quarter, tied 53-53. Neither side was able to score for over three minutes of the final frame but freshman Jay Dieterle’s free throw with 4:47 put Franklin ahead again. Gill drove for two to increase the lead to three. On Franklin’s next possession, Prunier was able to get the defense to switch after a handoff from Gill and easily drove to the hoop to make it 58-53 with 3:43 to go. But like they did in the third quarter, Westford Academy rallied back again. Jon Glidden brought WA within three but a pair of free throws from Gill pushed it back to five. Scotty Callahan floated one in the lane and Fiorillo drained a three out of an inbounds play to tie the game at 60-60 with two minutes to play. The teams traded turnovers over a 45 second stretch in a game of giveaways before Prunier’s hustle play set up Franklin at the end. A contested three from Dieterle with 30 seconds to go bounced off the iron but a strong effort from sophomore Connor Peterson helped the ball roll out to Gill. Gill eventually took a pass back from sophomore Paul Mahon and immediately raced around his defender and to the basket for a layup with 17 seconds to play. Westford called a timeout with 12.3 left and ran a play to get a look at a three, but the shot bounced off the back of the rim and Peterson was able to track the high rebound as the buzzer sounded. After giving up 25 points in the third quarter, Franklin clamped down defensively and surrendered just seven points in the final frame. Dieterle tied his career-high with 24 points (18 in the first half) in his postseason debut to lead the Panthers while Prunier added 12 points, five steals, four rebounds and four assists. Gill had nine points and six points and four steals and Peterson added nine points and seven points. Franklin boys basketball (16-5) advances to the D1 Central Semifinals for the second straight year. The Panthers are scheduled to play #7 Framingham on Saturday at WPI at 5:00.